‘It seems to me it said what I wanted it to say.’ Vaughan Williams? Actually, it was Parry whose equally bluff no-nonsense comments – ‘I suppose it is a bit stern, as you say’ – reflect his willingness to absorb implied criticism without deflecting it. He wrote in this vein to a friend about the Fourth Symphony, the original version of which is what Chandos serve up, having long ago released the complete symphonic cycle under Matthias Bamert’s expert direction. Dating from 1889, its premiere under Hans Richter was well enough received – Elgar was in the audience – and a number of performances followed until in 1904, after hearing Dan Godfrey conduct it in Bournemouth, Parry decided to revise the work. Two decades after its premiere extensive recomposition meant that the original version, which had never been published, was to remain overlooked – until now. Jeremy Dibble’s authoritative booklet notes make clear the sheer extent of the revisions, which include the excision of the scherzo and its replacement by a completely new movement, the removal of the brief Intermezzo between the opening and slow movements and the retention of certain elements of the remaining three movements but in significantly altered form. This makes comparison between the original and revised versions a matter of interest for Parry enthusiasts who will know that the composer was prone to revision in any case. There is more confident brio in the revision’s opening movement, the original being the more direct and less inclined to refinement of development such as Parry introduced in 1909. Perhaps the sternness that Parry’s friend detected was channeled more towards a sense of solemnity in the new version, though the original’s overt indebtedness to Brahms, with unmistakable echoing of the Third Symphony, remain. The Intermezzo, though not even two minutes in length, contains a central melancholy panel, but the way this little movement moves into the Lento means it is, in effect, an intensification of the feelings generated by that brief slow section and not a genuine contrast to the opening Allegro. The Intermezzo tends to diffuse the expressive depth of the slow movement and for all its felicities Parry was surely right to ditch it. Gamba directs this slow movement with a sure hand, finding real consoling breadth, the evolving solo string solos and fine wind tracery of especial beauty. Dynamics here, too, are daringly drawn. The Scherzo that follows generates a real contrast, though its replacement in 1909 means that the symphony was to lose elements of its deft, swinging confidence. These and many other elements can be mulled over when considering the process by which Parry came to revise the work. A looser structure was to become more formal in design, and as a result the revision is the better organisational platform for Parry’s ideas. But the original is fascinating to hear. Proserpine is a ‘short ballet’ of 1912, based on Shelley’s poem, sung here by the Ladies of the BBC National Chorus of Wales, and heard in an edition prepared and edited by Jeremy Dibble. It was his only ballet score and manages to combine aerial grace with Wagnerian cadences. Grazioso and elegantly flowing it makes an unexpectedly delightful impression. The final work is Suite Moderne, composed in 1886 and revised six years later. This symphonically-structured work is heard here without its opening movement. I assume this is to do with CD timing issues though it seems a real shame to have to forego the Ballade and start with the second movement Idyll instead. The concluding Rhapsody owes something to Mendelssohn and Brahms but the Romanza is the gem and its light lyricism is irresistible. 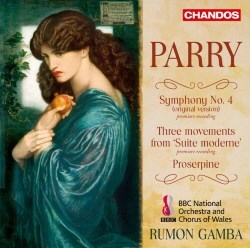 So, whilst the suite is less ‘moderne’ than traditional in the lineage of such as Tchaikovsky, it makes a good addition to the corpus of Parry recordings on disc. As indeed do its companion works; expertly prepared, well performed and of far more than mere footnote value.